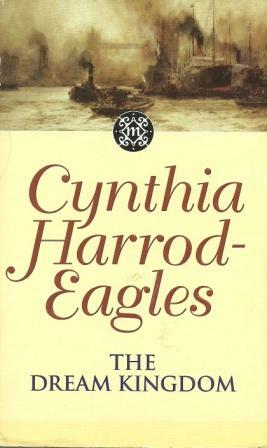 I’m starting to worry about what will happen when, possibly later this year, I finally set aside the last installment in the Morland Dynasty series by Cynthia Harrod-Eagles. Reading one of these books almost every month for just over two years has made them a sort of fixture in my reading life. They haven’t been my favorite books ever, but they’re good, reliable, solid historical fiction. After a disappointing book, dipping back into the lives of the Morlands has been a consistent comfort. I’ll miss them. With The Dream Kingdom, the Morlands have entered into the Edwardian era. Jessie and Violet are enjoying their first London season, Anne is becoming more deeply immersed in the suffragist movement, Teddy is earning a lucrative income providing linens for the White Star line, and Jack has fallen in love with aviation. Other historical developments that touch the Morlands include a budgetary and political crisis in Parliament, growing tensions between England and Germany, and the death of King Edward VII. Some Morland Dynasty books focus on just one or two threads, and others pack in tons of characters and storylines. Although I tend to prefer the former books, this was one of the better books in the latter category. Mostly, this was because I was riveted by Lady Anne’s activities with the WSPU. I already knew a little bit about the fight for women’s suffrage in England—I knew, for example, that imprisoned suffragettes who went on hunger strikes were force fed by means of tubes inserted in their noses. But it’s one thing to know the general outline and another to read an up-close description of a force feeding. This is one of the things that historical fiction can do—it can turn our stomachs in horror and fury in a way a straightforward account of the facts cannot. Harrod-Eagles also delves a bit into some of the tensions within the movement for votes for women. I love her way of getting at multiple sides of these big questions, and I would have liked more of that in this book. The whole book could have been about the suffragettes, and I would have been pleased as can be. That’s not to say, however, that the other storylines don’t have their pleasures. Many of the Morland men have taken an interest in engineering in one way or another, and this means that readers get to learn about the development of the railroads and, in this book, the dawn of aviation. I don’t believe I’ve talked about this before, but Harrod-Eagles does an admirable job of explaining the technical aspects of these fields without overwhelming readers like me who aren’t well-versed in physics. She doesn’t avoid the science, but it’s never confusing. I also enjoyed the contrasts between Jessie and Violet’s romantic lives. The evolution of marriage has been a consistent theme throughout this series, and the developments here were pretty easy to predict, but it still made for good reading. At times, I was annoyed by Jessie’s tendency to obsess over questions about what love really feels like and whether there’s one right man for her and how will she know and so on and on and on. But when I was 20, I obsessed over that too. I found Jessie’s introspection exasperating, but realistic. The Dream Kingdom was also a tremendous set-up for the next book, The Restless Sea. As The Dream Kingdom was drawing to a close, several characters were planning a journey to America. When you consider the title of the next volume and the fact that Teddy has been working for White Star, you can easily imagine where things are going. I can hardly wait! Ive just started reading this series. Im onto number 3. I love them. In my opinion, they (mostly) get better and better. She really hits her stride about book 8. Every time I see one of your reviews of the Morland Dynasty I cringe thinking that I have #1 on the TBD and you’re already on the 26!!! I’m glad to know they’re a reliable source of literary comfort though. Once you get started, you’re likely to get hooked! It’s a great way to see history unfold. I’m thinking I might have to try her Bill Slider mysteries. My library does have a few. If you wanted to read along at a slower pace, you could always read along with the Sourcebooks reissues. They published the first three last year, and I hope they continue. How did I know you were going to say that, Jenny? This year, I promise! You’ve really stuck to your reading here! I am still way back on book six or seven and at this rate I’ll be retired before I finish the series. I’m stuck in the Restoration era, which isn’t my favorite, and I think that’s why I’ve not been picking the books up. Maybe I need to try and read one a month as well–I’m going to grab the next book this weekend I think…well, we’ll see. I can’t think of another book series like this that you could lose yourself in for a good long while unless you like mysteries. And I also like having reliable reads on hand. The Restoration isn’t my favorite either, although I did like those books well enough. As I told Michelle, the series really hit its stride for me around book 8. Once it reached the Napoleonic Wars, I was hooked! Reading one a month has in some instances been a way to keep myself from reading nothing but Morland books. That sounds quite the epic ;) I hadn’t heard of this series, but 26 books? Wow! I’ll need to check whether my libraries has them. The series is actually up to 33 books now, with the 34th (and final) book coming this year. It’s amazing–hundreds of years of history. This is the second time I’ve come across this author today and I was completely unaware of the books before. It seems like a message to me! Must track one down. Twice in one day–it must be fate!